This goes back to my early independent exploration of music when just at 12 or 13 I discovered the Grass Roots, and takes me back to last November when we were still in the G’s. 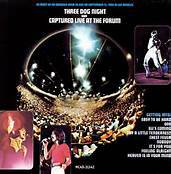 Three Dog Night was the next group I really got into. A pop-rock group featuring three singers harmonizing with a back-up band behind them, with one of the singers having a mustache, which as we recall would only add to the attraction, they were more of a cover band. None of the songs on this live album, which is not bad by the way, is written by anyone in the group. They were pretty good at it though, and had hits with Harry Nilsson’s “One,” “Easy To Be Hard,” from the Broadway show Hair, and my favorite, the great Laura Nyro’s “Eli’s Coming,” all of which I got to hear during this night’s workout. At one point on the record, one of the singers answered the concert-goers in the back who were screaming out that they couldn’t hear, and another singer said, “See, you should have gotten the 5.50 tickets in the front.” Can I actually remember a time when the best seat, or best of anything, was $5.50? We added a little Bette Midler again, not only because it’s a short album, but because I hadn’t exercised for two days. Sure, I had music on Thursday night as I cleaned up the place, which really needed it, for my Friday night company, and was motivated to move as I tidied. Then last night, I overindulged on things that are not conducive to anyone’s diet (we did have crudité), and now have to eat the leftovers, so I’ve had yet another set-back. But I love these little get-togethers, making the set-back very worthwhile. This was the first gathering we’ve had since my birthday in late November, and the first without my old pal Vicki in a long time. I would say that she was there in spirit, but I really hope she has more important things to do now. I will say that she was remembered and missed.